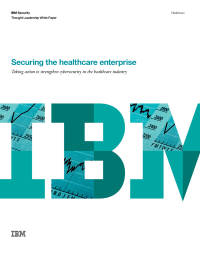 Securing the healthcare enterprise. Taking action to strengthen cybersecurity in the healthcare industry. The realm of digital security is, by nature, something of an open-ended arms race between system and data defenses on the one hand and creative, highly persistent attackers on the other. There will likely never be any point at which one side “wins” conclusively—each successful defense strategy or attack plan simply changes the game to a degree and raises the standards for the next round of attack-and-defend. With disastrous data breaches making headlines far too often, healthcare executives need to re-think the dangers of today’s digital environment. What are the best ways to protect the business in the face of fast-evolving threats? Keeping one step ahead of attackers will require a combination of measures, including robust system defenses, analytics to spot intruders fast and the ability to react quickly whenever an intrusion occurs.